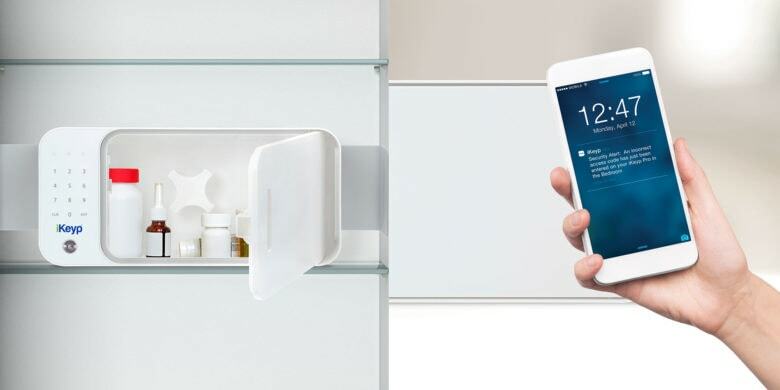 With Wi-Fi connectivity, smartphone access and other cool features, this smart safe is ideal for storing often-used valuables like meds. Everyone owns valuables they want to keep safe, from jewelry to passports to medication. But keeping the stuff we need on a daily basis in a traditional metal safe just isn’t practical. Ever tried to enter a passcode on a safe’s clunky dial in a rush? It’s hard, by design. iKeyp is a safe for storing items you need in a hurry and on the regular. Whether it’s prescription meds, important documents or your car keys, you can access it instantly via your smartphone, a built-in keypad or physical backup key. iKeyp is sealed against water and humidity, with a built-in siren to ward off unauthorized access. You can set the whole thing up in seconds, thanks to extendable “wings” that hold it in place. You can place this safe in the closet, on a bookshelf or under your desk — anywhere that’s got between 8.5 inches and 22.6 inches of clearance. Wherever you put it, Wi-Fi connectivity means iKeyp can push activity notifications, real-time security alerts and even medication reminders. Buy now: Pick up an iKeyp Safe for $99 — that’s 33 percent off the usual price.